Secretary-General Ban Ki-moon has sent Palestine’s application to become a United Nations Member State to the Security Council for its consideration after receiving the bid from Palestinian Authority President Mahmoud Abbas earlier today. Mr. Ban said he sent the application to Ambassador Nawaf Salam of Lebanon, which holds the Council presidency this month, in line with the provisions of the UN Charter. 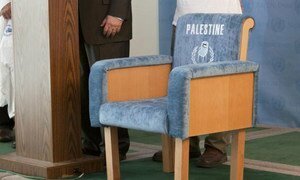 Palestine currently has observer status at the UN. Any application for UN membership is considered by the Council, which decides whether or not to recommend admission to the 193-member General Assembly, which then has to adopt a resolution for the admission of a Member State. Mr. Salam said he would convene Council members on Monday to hold consultations on the Palestinian application. Members of the Middle East diplomatic Quartet – comprising the UN, the European Union, Russia and the United States – met today in New York and took note of the application. In a statement issued after their meeting, the Quartet members reiterated appeals to the Israelis and Palestinians to resume direct bilateral negotiations without delays or preconditions. Saying it accepts that a meeting will not in itself re-establish the necessary trust for formal negotiations to succeed, the Quartet proposed a series of steps and a timetable with the aim of reaching a lasting Middle East peace agreement by the end of next year. A preparatory meeting between the two sides would be held within a month to agree on the agenda and method for negotiations, and then within three months the Israelis and Palestinians would be expected to produce “comprehensive proposals… on territory and security” and to have made substantial progress on those issues a further three months later. To support this plan an international conference will be convened by the Quartet in Moscow, while a donor conference to generate financial support for Palestinian State-building will also be staged. Earlier, in his address to the Assembly’s annual general debate, Mr. Abbas said the application for full membership of the UN is on the basis of the so-called 4 June 1967 borders. “Palestine is being reborn. This is my message,” he said, adding that he hoped it did not have to wait long for the application to be approved. He cited the construction of settlements in the West Bank, the refusal of permits for Palestinians to build in East Jerusalem, and the extensive number of military checkpoints limiting Palestinian movement and the ongoing blockade of the Gaza Strip as examples of such policies. He stressed that over the past two years Palestinian authorities have worked hard to implement a programme of building up State institutions, as well as strengthening civil society, increasing government accountability and promoting the participation of women in public life. Israeli Prime Minister Benjamin Netanyahu also addressed the Assembly today, saying that lasting peace in the Middle East will only be achieved through direct Israeli-Palestinian negotiations, and not through any UN resolutions. The President of the Palestinian Authority, Mahmoud Abbas, told Secretary-General Ban Ki-moon today that he intends to submit an application this Friday for Palestine to become a United Nations Member State.